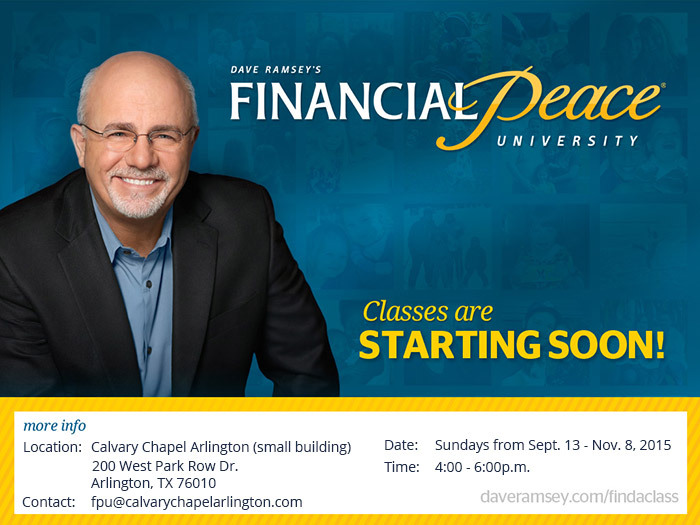 David J. will be leading a Dave Ramsey Financial Peace University class in the small church building this fall. Don’t worry, Dave Ramsey will be doing the actual teaching via video and David J. will be facilitating the small group discussion afterwards. It’s going to be FUN! Class will be on Sundays at 4pm in the small chapel building, starting Sept. 13 and going for 9 consecutive Sundays. This is not your typical money class, or about “how to get rich.” This is a practical step-by-step action plan on how to handle God’s money according to what God laid out in the Bible. The average family completing the course pays off $5,300 of debt and saves $2,700 in just 90 days. That’s an $8,000 turnaround!! A Financial Peace University membership is required for those attending the class, the cost of which is $100. Only one membership is required per family. All others will need to have their own membership. If you wish to attend, you can register online here, or you can fill out a registration form on the table located in the back of the main sanctuary and give it to David J. We are going to buy the memberships as a church, so please make out a check payable to Calvary Chapel of Arlington and state in the memo line on the check that it’s for “Dave Ramsey” or “Financial Peace University”. The deadline to be included in the church group buy is August 16, 2015. Afterwards, you will need to buy directly from Dave Ramsey’s website. If you have any questions, please feel free to send an email to fpu@calvarychapelarlington.com or talk to David J. at church.